The SKP 100 G3 transmitter works with our Sennheiser EW100 G3 radio mic kit as an optional microphone transmitter usually for a boom mic. The unit features an unpowered XLR port, allowing connection of microphones and other xlr equipment - you could put it on the mixing desk output. 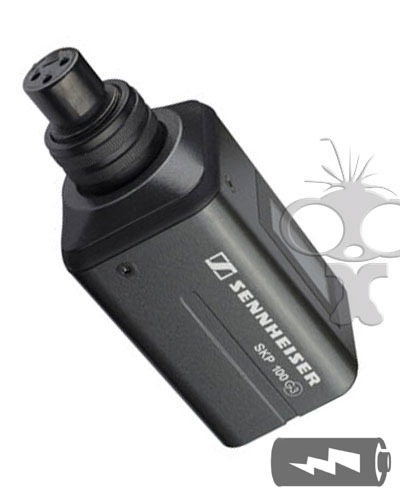 Compatible with other Sennheiser radio mic equipment such as the G1/G2 and G4 series in the same frequency range. The unit can transmit over 1600 frequencies and can store pre-sets. We currently hold a UK frequency license, contact us for more information. The unit requires 2x AA battery. Because this unit does not supply power to the microphone, you will require either a dynamic mic (such as the SM58 which needs no power) or a battery powered microphone such as the Rode NTG2, Sennheiser ME66 kit mic or the Azden SGM2 microphone which has an on/off switch making it an ideal combination for use as a presenter microphone for live events. Add the Porta brace SK100 radio mic bouncer/cover for protection.